Exhibition schedule: Harvard Art Museums and the Ethelbert Cooper Gallery of African & African American Art, Boston, February 3–May 8, 2016. Art of Jazz: NOTES. Installation view. Ethelbert Cooper Gallery of African & African American Art at the Hutchins Center, Boston. Photo by Melissa Blackall. If American modernism had a soundtrack, it would be jazz. A homegrown genre, its music came to define the burgeoning northern cities, the cultural forms of black expression, and an avant-garde impetus to question established boundaries. In collaboration with the Harvard Art Museums, the Ethelbert Cooper Gallery of African & African American Art presents the Art of Jazz: FORM/PERFORMANCE/NOTES. 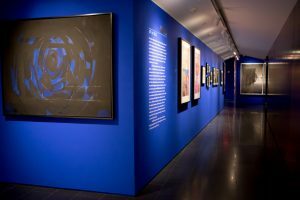 The three-part installation explores the intersection of jazz and art through more than seventy objects, spanning just under a century of material that includes paintings, photographs, album covers, jazz ephemera, and contemporary installations. Truly a collaborative enterprise, the concept behind the project was developed from a course co-taught by David Bindman and Suzanne Preston Blier at Harvard University, who together with Vera Ingrid Grant, director of the Cooper Gallery, organized a comprehensive arrangement of diverse works. Not only does the exhibition explore the formalist influence of jazz and how its experimental themes impacted artistic style, but it also addresses the cultural resonance of this medium through its intrinsic connection to the African American experience, the modern urban landscape, and the bluesy southern jazz club. While the danger of a multimedia layout of this complexity can come across as busy or disjointed, the curators manage to foster a nuanced and rewarding dialogue, in which motifs, much like melodies, are taken up, adapted, and interpreted by each artist in turn, resulting in a harmonious dialogue across two museums. The newly renovated Fogg Museum houses the first part of the exhibition called “Form” in one of its teaching galleries, while the remaining two sections, “Performance” and “Notes,” are located across the Harvard University campus at the Cooper Gallery. While geographically separate, the exhibition still manages to be thematically connected; “Form” successfully introduces the visitor to a series of motifs that are further expanded upon by “Performance” and “Notes.” Selected from the Harvard Art Museums collections, the intimate display in “Form,” as curated by Bindman and Blier, features works by Stuart Davis (1892-1964), Jackson Pollock (1912-1956), Hans Namuth (1915-1990), Jimmy Ernst (1920-1984), William Baziotes (1912-1963), and Henri Matisse (1869-1954), which examine the influence of jazz on style and the practice of painting. Davis, a jazz enthusiast, betrays the impact of music on his own compositions in six drawings on view. An improvisational attitude is created by the freedom of line and abstracted color, which seem to boogie and jive on the page. Across the room, two Jackson Pollock prints hang beside a Hans Namuth photograph of the painter at work, encouraging the visitor to consider the performative nature of Pollock’s artistic process. His cacophony of movement translates into vibrant gestures that seem to parallel the heady rhythms and syncopated refrains of swing. While the artful imprint of jazz finds articulation in this space, so does its social character in works by Romare Bearden (1911-1988), William Henry Johnson (1901-1970), Edward Steichen (1879-1973), and Viktor Schreckengost (1906-2008). At the center of the room, “Jazz” Punch Bowl (1931), a brilliant blue porcelain bowl by Schreckengost depicts overlapping forms of surging skyscrapers, blaring horns, and overflowing cocktails. Painted and fired at the height of Prohibition, the punch bowl expresses a subversive tone that celebrates the shadowy backrooms of speakeasies, where admirers of jazz could congregate and enjoy the hot sounds of the saxophone over a cold drink. By its nature, the punch bowl is a social tool, which allows for the enjoyment of its potent contents. Moreover, Schreckengost’s design, similar to the narratives painted on ancient Greek vases, reads like a heroic epic against the backdrop of an urban skyline. Soul History (1969), a collage by Romare Bearden, similarly portrays a mythological picture of jazz as tied to the history of African Americans. At the center of the composition, a nativity scene in a dilapidated shed recalls a life in the South before the rupture of the Great Migration. Instruments and musicians sprinkled throughout highlight the ever present role of music as an emotive conduit for black expression. Indeed, the formation of jazz, a confluence of numerous styles, finds it roots in southern spirituals and folk music. Through collage, Bearden adopted a fractured visual medium for asserting a shared black heritage of epic proportions, colored by struggle and loss and voiced by the blues. Not all of the works in “Form” explore exclusively formal questions or social content; often the more interesting works do both, such as Bearden’s Brass Section (1979), a lithograph depicting three musicians mid-performance, whose bodies and sounds blend together in a swirling fusion of color and form. While the curators identify two seemingly disparate strains of jazz’s influence—the formal and the social—their display positively encourages an easy cohabitation of the two, showing the various ways in which artists found inspiration in both the style and ethos of jazz. The bulk of the exhibition continues with “Performance” and “Notes” at the Ethelbert Cooper Gallery of African & African American Art, a venue that recently opened in the fall of 2014. Also curated by Blier and Bindman, “Performance” displays a rich collection of jazz ephemera, including album covers and posters designed by artists who similarly explore aesthetic and cultural themes through these popular commissions. Entering the gallery via a long ramp, the visitor first advances along a line of albums, featuring work by Aaron Douglas (1899-1979), Romare Bearden, Josef Albers (1888-1976), Ben Shahn (1898-1969), and Andy Warhol (1928-1987). Seamlessly, as the visitor continues, two square screens appear between the albums, each flashing a cover design and a track from a record. From above, the dulcet notes of jazz emanate from innovative speaker hoods, which isolate the sound to within a fixed perimeter. The immersive effect manages to transport the visitor, engaging two senses at once while limiting the experience to a modest footprint. The challenge for many exhibitions that play multiple sound installations is the threat of disruptive and interruptive music vying for attention in the gallery. Fortunately, the intimate confines of the Cooper Gallery succeed in creating pockets of sensory exploration that do not compete, but instead communicate with one another. 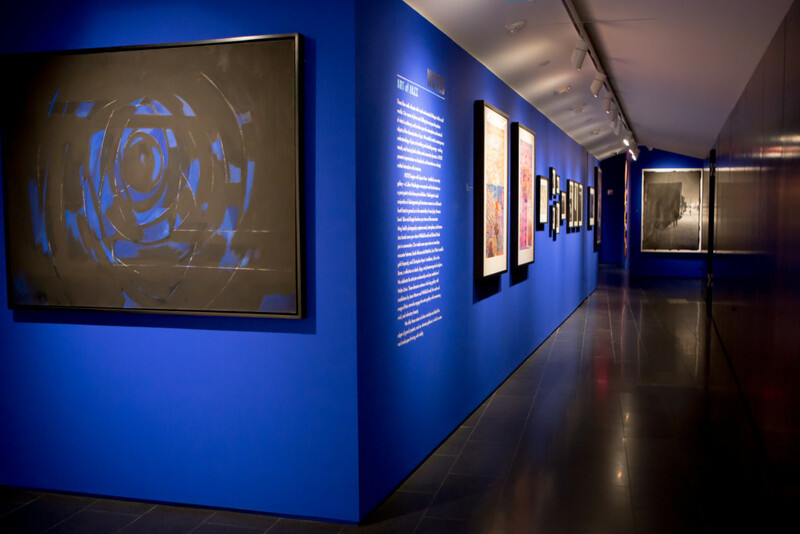 Along the right side of the ramp, facing the album covers, a myriad display of works, including a sunny poster of a smiling Lena Horne, a painted portrait of James Baldwin by Beauford Delaney (1901-1979), and a signed photograph of Josephine Baker, signals the curators’ other objective in “Performance”—to highlight the legendary personalities who performed for both the audience and the camera. A collection of photographs by Carl Van Vechten (1880-1964) and little-known photographer Hugh Bell (1927-2012) portray captivating portraits of talented singers and musicians. In a sequence of four photographic stills, Bell captures a spectrum of emotions from Billie Holiday on the night of her last performance. Smiling and gesturing with a cigarette in hand, she alternates between expressions of incredible joy and abrupt sorrow. However, the photograph Hugh Bell selected to publish at the time was her most vulnerable depiction, where she appeared most distressed. By including the other images from the series, the curators reveal the many facets of Holiday’s personality, each accessible to her as a performer. A Norman Lewis (1909-1979) work called Blue and Boogie (1974) with its abstracted hypnotic rings of black and deep iridescent blue introduces the visitor to the final section, “Notes.” An entirely different space overseen by curator Vera Ingrid Grant, “Notes” is a contemporary response to modernism’s call, and the vivid blue paint that colors the gallery walls is a bold, but necessary statement, signaling the vitality of jazz as it continues to affect artists today. This section, as suggested by its title, can be construed as a footnote to the earlier galleries, and many of the same issues raised in the “Form” section of the exhibition that concern the aesthetic and social aspects of jazz, are elaborated on further in this space. The visitor first notices three playful collages by Walter Davis, titled Nights in Tunisia (1986), Billie’s Red Dress (1985), and Bird in Flight (1979), which recall the work of Romare Bearden, but are differentiated by their increasing abstraction and effusive patterning. Their joyful themes provide a poignant contrast next to Ming Smith’s darker photographs of urban isolation. In her work, Smith tests the parameters of what defines a photograph in much the same way that jazz is experimental and rewrites itself. She uses soft focus, reveals the exposed edges, and applies paint to the prints, as seen in Angels/Marvin Gaye “Save the Children” (2016) that depicts two superimposed images of a young family and a performing band of musicians. A previous iteration of the work at the Museum of Modern Art utilizes yellow and purple pigments, while this print employs streaks of red that mar the surface, no doubt symbolic of the latest violence against African Americans epitomized by the recent deaths of Trayvon Martin, Eric Garner, and Michael Brown. While Ming Smith relays an urban experience, Christopher Myers’ mixed-media installation Echo in the Bones (2014) turns to the South, specifically the funerary brass bands of New Orleans. Inspired by music he heard in Vietnam, he constructed fantastical instruments affixed with multiple horns and commissioned scores that feature music from these same contraptions. Together with photographs and designs of the instruments, the installation addresses both the local character of New Orleans memorial customs, as well as the international spirit of jazz, now played throughout the world in such places as Saigon. The most striking work in the exhibition is After an Afternoon (2008) by Whitfield Lovell, an assembly of stacked vintage radios collected by the artist, which emit three simultaneous broadcasts from the 1940s. Its sentimental pull induces the visitor to linger and listen. Against the pristine blue gallery walls, the dusty materiality of the radios becomes starkly apparent. A modern-day hearth, the radio facilitated the gathering of people in the family home, perhaps in the kitchen, living room, or even the private sanctuary of a bedroom. For its impact on jazz, the radio enabled ragtime, blues, and big band to reach a broader audience beyond the cramped swing clubs in New York and Chicago. The installation at first elicits a happy nostalgia for a better time, yet wafting from the radio are the grim lyrics of “Strange Fruit” as performed by Billie Holiday. As she sings of the “black bodies swingin’ in the southern breeze,” the strident voice of a white broadcaster delivering the news and a commercial jingle contend for attention. The three overlapping programs signify a disturbing truth about mid-century America, that two extant realities for white and black Americans existed, one colored by opportunity, the other by oppression. For those African American jazz singers who succeeded in getting their music past the censors, the radio allowed them to convey to mainstream listeners a lifetime of injustice and prejudice. The capstone of the exhibition is Jason Moran’s project, Staged: Three Deuces (2015), a recreation of a New York jazz club on Fifty-Second Street where Miles Davis and Charlie Parker often played. The reconstructed stage encircled by padded walls occupies a small corner of the gallery. A drum set, double bass, and piano sit empty, devoid of their musicians, but on the hour, the installation comes to life as the Steinway piano plays two recordings as composed and played by Moran. While most of the exhibition shows the imprint of jazz on artists, this piece suggests the impact of art on the musician as a vehicle for expression. Moran, who is a renowned jazz pianist, turns to installation art in his pursuit to apprehend a moment of jazz history from the 1930s and 1940s. In a recorded interview about Staged from its premiere at the 2015 Venice Biennale, Moran remarked, “there are a lot of ghosts in here,” and his piece successfully captures the fabled myths of these early musicians in the space. The impression is truly spectral when the first composition, “Hammer 2,” begins to play on the piano. The keys depress in a cascading fashion from high to low notes in rhythmic visual waves. The score, “He Cares,” follows shortly thereafter, and its mournful tenor speaks of bone-breaking labor and terrible loss. The show for the most part limits its wall text to introductory panels at the start of each section, and while some visitors may be left wanting for more information on individual works, the wise decision by the curators to keep the language concise and pointed enables visitors to glean and extract only the key themes. A verbose exhibition would only clutter and distract from this eclectic array of visual culture and fine art at the Fogg Museum and Cooper Gallery. When experienced together, the three sections of Art of Jazz provide an attentive and manifold reading on the influence of jazz from both a formal and cultural perspective. About the Author(s): Kelsey Gustin is a doctoral candidate and Raymond and Margaret Horowitz Fellow in American Art at Boston University.